How to create tree view in ASP.NET? 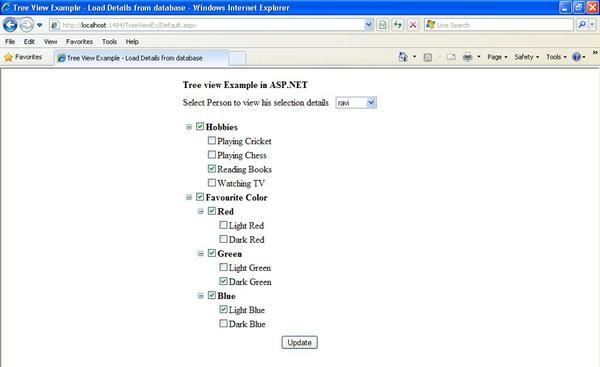 In this article I have explained about how to create tree view concept in the ASP.NET. How to store selected tree view node in the database table. This tree view technique is used to store hierarchical format of your data in web page. Learn how to create tree view in ASP.NET? For example I have created TreeView_Detail table and store Hobbies, favourite color etc. based on user selection I store that values in the Person_Detail table. &LT;asp:TreeView ID="tvsample" runat="server" ImageSet="Custom" ShowCheckBoxes="All"
&LT;NodeStyle Font-Names="Times new Roman" Font-Size="12pt" ForeColor="Black" HorizontalPadding="0px"
Here with I have attached source code download it and try to learn about tree view concept in Asp.NET . I hope this article help to know about tree view concept in ASP.NET. I learnt fom your article. keep posting. Hi Ravindran, it's a nice article. How can i find the values associated with all the checked checkboxes and store it in some hidden field. How can i find the values associated with all the checked checkboxes and display it in textbox.